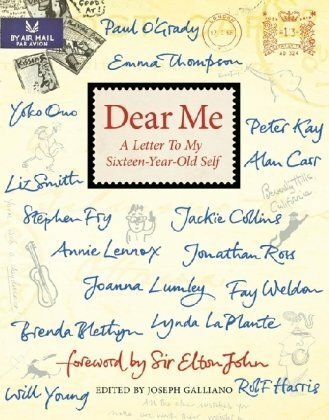 A while ago I read a book called ‘Dear Me’, the premise of the book was that a selection of writers, comedians, actors and other noteworthy people would write a letter to their 16 year old self. This letter would contain the wisdom of their years of experience, the benefit of hindsight and some sage advice. It was a good book, with some humorous moments, some quite poignant and a great deal of introspection and soul-searching. Before writing this I checked that I had got the name of the book right and found it still has its own website that people regularly contribute their own ‘Dear Me’ letters to. Since reading it I have regularly mused on what I would say to my 16 year old self if I were in a position to offer advice. These range from the obvious (I would tell me the names of some horse race winners and what stocks and shares to buy into), to the very particular (I think 16 year old me really should know not to eat that Chinese take-away at the end of his Stag night). As well as being able to sustain lengthy periods of being awake, all-nighters, whole weekend parties, getting by on a couple of hours – and still putting in a full shift at work the next day, you should enjoy the sleep. Go to bed at 9 if you want. Stay there and sleep for as many hours as you can. Enjoy the bliss of not having to get up in the morning if it’s not a work day. Sleep! This is a more precious commodity than you know. Once you have children an all-nighter takes on an entirely different dimension, with small, wet, hungry, sick babies being passed from parent to parent as they struggle to stay awake and do what needs to be done. Every dawn chorus is greeted with wide-awake enthusiasm and the desire to get you up so you can entertain them more effectively. Going to work on limited amounts of sleep feels less heroic than it used to, and certainly doesn’t endear you to co-workers. Add to that the joy of not being able to manage to go a whole night without needing the toilet. What has happened to my middle-aged bladder? I am sure I used to go for days on end without needing to go for a pee, now 5 hours seems to be my absolute best, and that’s only if I have had nothing to drink for the last few hours before that. I daren’t have anything after 9 in the evening. On top of those things are the pressures and challenges of day to day life. The little things that wake me up at 4 AM, bolt upright, sitting up in bed wondering if I remembered to empty the washing machine or lock the back door. Things I should have done for work. Or, worst of all, the cats wanting to be let out. In case the 16 year old me somehow gets to read this, I haven’t slept well this week. Enjoy this song if you have 3 minutes and 16 seconds to spare.